2019 NASFPSC | FFC, Inc. 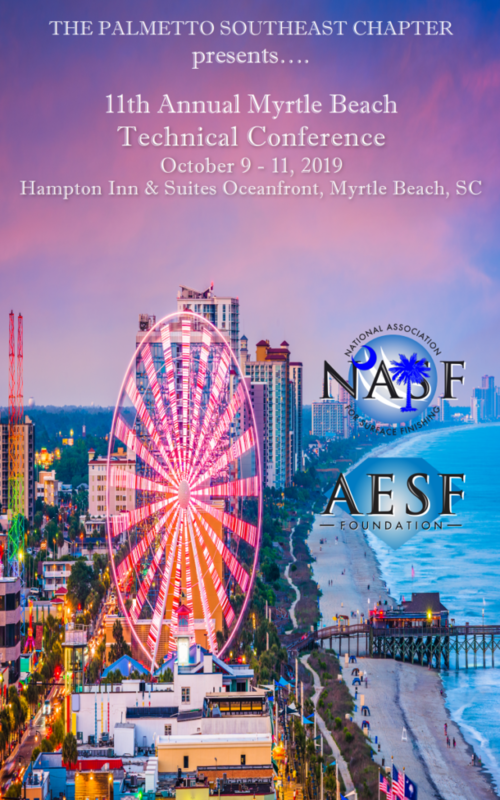 The NASF Palmetto Southeast Chapter will hold it’s 10th Annual Fall Technical Conference at Myrtle Beach, SC, Hampton Inn & Suites Oceanfront Hotel. Bringing together a metal finishing community of professionals to promote and advance the industries past, present and future. Registration includes attendee, spouse/guest, coffee, snacks, drinks, happy hours and a keynote luncheon. Registration – 1 p.m. to 1:30 p.m.
Hampton Inn & Suites Oceanfront 1801 South Ocean Blvd., Myrtle Beach, SC. All Ocean Front Rooms (Double, Queen or King). Call: (877) 946-6400 – Conference Rate $119.00 + tax. Use code ASF. Conference Rate Expires: 9/6/18.